Senna Proctor on the top of the podium at Brands Hatch. Picture: Dennis Goodwin. BRIDLINGTON’s Senna Proctor claimed a sensational debut victory in the second race of the Dunlop/MSA British Touring Car Championship meeting at Brands Hatch yesterday. Starting from a lowly 27th place on the grid, Proctor took the gamble of starting on slick tyres and it paid off handsomely as the Yorkshire driver fought his way up through the field as the circuit dried. Senna Proctor leads the pack at Brands Hatch. Picture: Dennis Goodwin. By lap 22 of 27 Aiden Moffat’s Laser Tools Racing Mercedes and Proctor’s Vauxhall Astra were in first and second positions, having made it past the majority of the field struggling on wet tyres. Moffat then ran wide through Druids corner and contact was made between him and Proctor on the run down to Graham Hill Bend. Moffat’s Mercedes hit the barrier and Proctor took the lead and held on to claim a famous victory. “I’m over the moon,” said an ecstatic Proctor after the race. “I’ve winded myself jumping up and down celebrating. This is unbelievable, and all credit to the boys at Power Maxed TAG Racing and all of our sponsors – they’re the reason I’m stood here today. “I went round on the green flag lap and said to my engineer, ‘there are a few dry patches forming’, so he replied, ‘let’s put slicks on then’. I said, ‘we’re not going to win the race on wets but we just might on slicks, so let’s give it a go’ – and look what we’ve done! 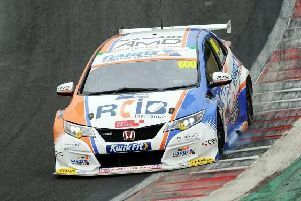 Senna Proctor celebrates his victory at Brands Hatch. Picture: Dennis Goodwin.